In life, first impressions are crucial. That’s also true in real estate. When potential buyers pull up to a home, they immediately start passing judgment. If they’re disappointed by the outside, you’re already starting on the wrong foot. That’s why it’s so important to maximize your home’s curb appeal. You want potential buyers to see your home from their car and get excited. With just a few fixes, you can increase your chances of selling your house fast. Buyers know instantly whether they like a house or not. Here are five front yard curb appeal ideas to create a strong first impression and maximize your ROI. A beautiful walkway to your front door can bring a lot of curb appeal to your property. There are all sorts of materials you can use depending on the look you want to achieve. A stone pathway will add charm to a country home. White pebbles can make a beach house look even more welcoming. Along the walkway, you can add planters, flowers, or lights. A stylish or charming fence can pull together the look of a house. This addition can easily add curb appeal to your property. People always dream of owning a home with a white picket fence, after all. Fences look great, but they’re also practical. This feature can be a big plus to home buyers with small children or pets. Don’t have a big budget for a front yard overhaul? Small changes can still make a big impact. One easy and inexpensive upgrade is to give your mailbox a makeover. You can find something shiny and new for as low as $20. Just be sure that you’re adhering to all the mailbox regulations of your area. If you’re trying to sell your home, a fresh looking lawn is a must. That means you need to be watering and cutting it regularly. You should always be ready in case someone wants to tour the house last minute. Your lawn isn’t looking too green but potential buyers are visiting tomorrow? Don’t sweat it! Try using lawn paint to quickly spruce up your grass. Sprays on the market are non-toxic, environmentally-friendly, and safe for pets and kids. If your lawn is small or you’re up for the project, you can even do it yourself. If your driveway isn’t looking its best, it can ruin your home’s curb appeal. An average driveway tends to take up a lot of space in front of your property. If it doesn’t look good, it will negatively impact the rest of the front yard. Redo the whole thing if possible. Not in your budget? Consider doing a spot fix of the holes and cracks. 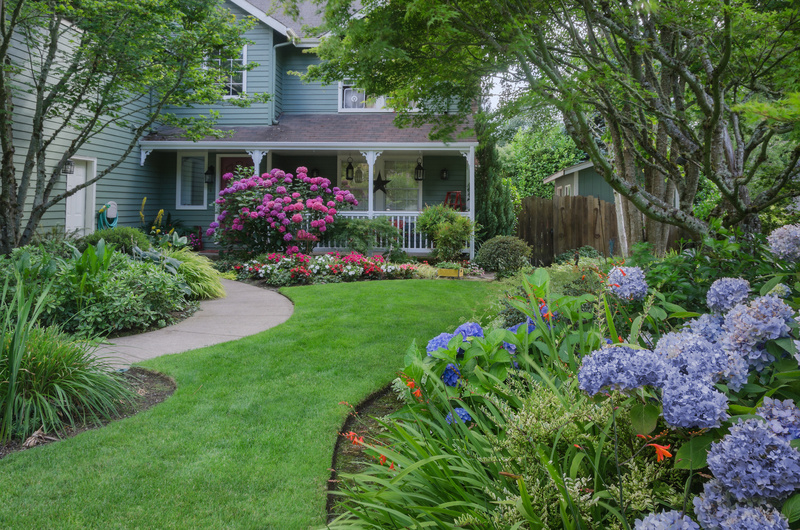 These front yard curb appeal ideas will boost your home’s value. If you don’t have the budget for big changes, that’s fine. Any steps you take to improve the look of your house will help. Are you looking to sell your home? We buy houses no matter how bad the yard looks. Contact us today to learn more!